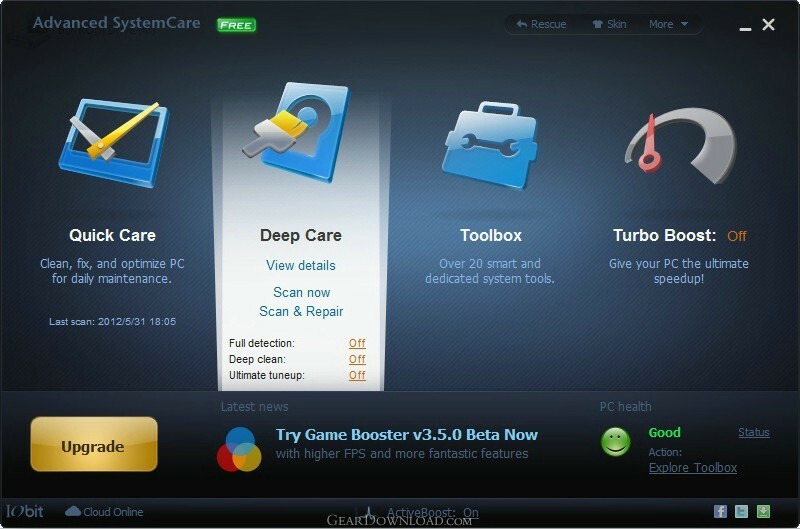 Advanced SystemCare - Keep your PC being error-free and running at the peak performance. + New FaceID - Automatically catches intruders who are secretly accessing your PC and prying into your privacy with new facial recognition technology. + No Annoying Ads and Safer Surfing - Removes various online ads and blocks more malicious websites with the larger online database, supporting Google Chrome, Mozilla Firefox, and Internet Explorer. + Faster Startup - Optimizes startup items to shorten boot time with new Startup Optimization in Clean & Optimize. + Smoother PC - New Resource Manager in Performance Monitor provides an easy way to check the processes taking high RAM/CPU/disk usage in real-time. What's New: + New FaceID - Automatically catches intruders who are secretly accessing your PC and prying into your privacy with new facial recognition technology. + No Annoying Ads and Safer Surfing - Removes various online ads and blocks more malicious websites with the larger online database. This download (advanced-systemcare-setup.exe) was tested thoroughly and was found 100% clean. Click "Report Spyware" link on the top if you found this software contains any form of malware, including but not limited to: spyware, viruses, trojans and backdoors. Advanced WindowsCare Professional 2.72 - An Always-On and Automated, All-In-One PC Care Utility. IObit Toolbox 1.2 - IObit Toolbox reaches all-directional computer diagnostic & management. Driver Booster 4.4.0.512 - Automatically identify outdated drivers and keep it up to date with 1-click. MacBooster 4.0.3 - MacBooster is an easy-to-use yet powerful system utility for Mac OS users. iFreeUp 1.0.11.974 - Free tool on PC to clean up storage space and manage files of your iOS devices.